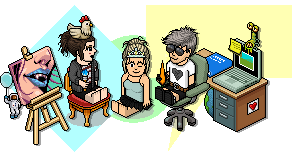 Thread: Habbox Easter Eggstravaganza Forum and Site! The Habbox Easter Eggstravaganza forum and site are now live! Forum tasks and mini-games will be made available by visiting either of these sites on the 19th! Help us save Easter from Thugs Bunny and earn yourself a MASSIVE amount of credits! Be sure to check back on the 19th!! Habbox Easter Eggstravaganza is now fully underway!